Sen. Rand Paul, a Republican from Kentucky, has threatened to try to block the confirmation of Janet Yellen to replace Ben Bernanke as head of the Federal Reserve, according to a report on CNBC. The threatened hold means that Yellen would need 60 votes on the Senate floor on a cloture motion to break that hold. The Senate Banking Committee must first hold hearings on Yellen’s nomination, and recent reports have suggested those will come in mid-November. There will be 55 Democrats in the Senate and 43 Republicans. In addition, there are two independents who caucus with the Democrats. 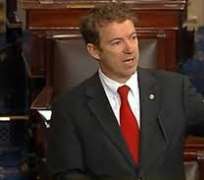 The CNBC report, citing a source close to Paul, said the senator wants to force a vote on his bill that would open up Fed policy deliberations to audits by the Government Accountability Office. His father, Ron Paul, a retired Republican congressman from Texas, tried to pass similar legislation but was never able to overcome Fed objections. The U.S. central bank has argued that such audits would amount to political interference in rate decisions .